← WE HOME-MADE A FLYER for the Type-IN ! OK, Chris Wink, one of the co-founders of Technically Philly (and featured in an earlier post here) , invited us to set up a Mini-Type-IN at the opening bash of Philly Tech Week. 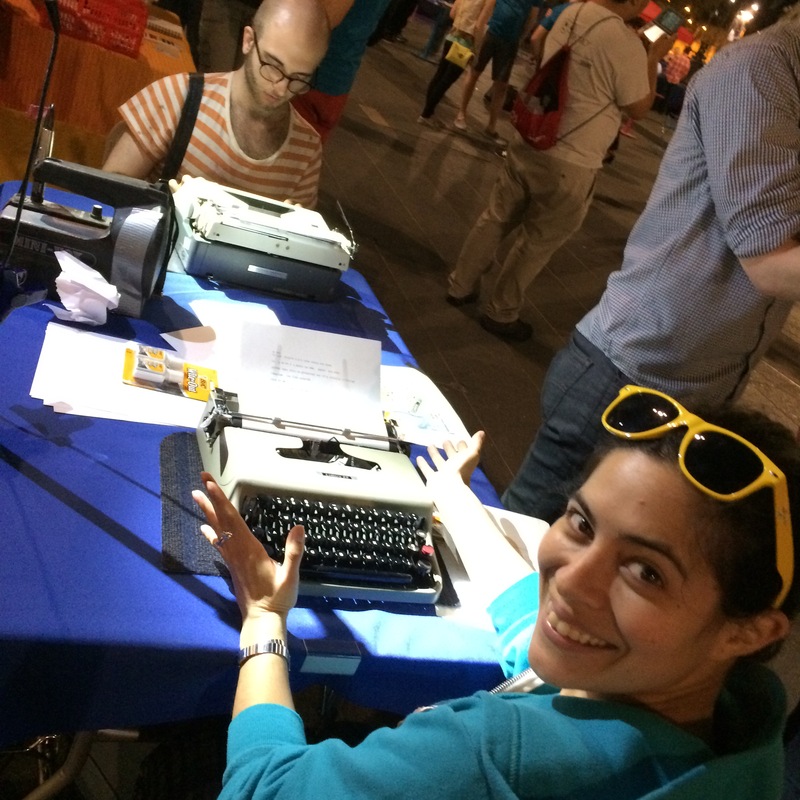 We trundled an Olivetti Lettera 22, an Olympia SM9, and several hundred sheets of bond paper into Dilworth Plaza next to City Hall. Surrounded by scores of tables packed with the latest circuitry, we were prepared to be mocked, or worse, ignored, by tech-centric millennials. Au Contraire, Claire! We wore out our voicebox explaining the two machines; there was a line of thrilled first-time-typists (and a few nostalgists as well) waiting to get a clack at our machines from the opening bleep till closing (nearly 30 minutes over the limit). Parents boasted to their disbelieving kids, “I used to write actual homework assignments on one of those.” Satisfied neo-typists dashed off clutching the “hard copy” they’d stamped out with their force of their own little digits. We hope to see some of these fresh young faces at the Type-IN on May 16th in Manayunk! Thanks, Philly Tech Week, for letting some classic QWERTY operators hang out with the chipsters! Excellent! I like the term “chipsters.” And often, it’s very high-tech people who take the most pleasure in a return to “analog” technology.